It’s that time of the year where new year resolutions are crumbling and dry-January folks have their eyes on next Friday. We’ve all battled through Blue Monday and despite it initially looking like not much racing was going on there’s actually been a fair bit of GDH action this weekend. We’ve received some detailed reports, so grab a brew/beer/gin/energy gel and settle down for the weekly news. Before we launch into the full report, just a reminder that next weekend is the first of the club fell champs races – the Mickleden Straddle. It’s a “BL” which I’m reliably informed means its Bloody Long. I’ve just checked and it looks like the race is actually full, which renders this reminder a little useless. Maybe you can bribe the organiser for a place if you haven’t got one already? It’s a lesson to get those Champs entries in early! Whilst we’re on reminders, it’s the club AGM on Wednesday at the Oakwood 7:30pm. I’ve unfortunately not been able to attend one so I can’t reliably report on what happens, but there is an agenda and I hear there is generally some chair throwing at the end. So definitely worth making an appearance. I’ve ran this one a couple of times myself and it’s a cracker. Especially when you end up covered in glitter at the Ram’s Head in Disley and have to run for the last train… but that’s a completely different story. Reports of the evening are thin on the ground, but Liam Amos is pushing strong rumours that he beat his dad. However, Strava never lies and it looks to me like Paul Amos had a clear lead by 45 seconds. We might need a video replay to settle this one. Wendy McMahon described it as “ridiculously muddy” and perhaps she can tell us who was really over the line first? The kit check and registration queue was very long, with FRA rules rigorously enforced. Quite right too. I was going to run in full waterproof body cover to keep the wind out. I wasn’t wearing much underneath that, mind you. 😉 We gathered outside to wait to be checked through into the starting pen to ensure that all starters were correctly recorded. There were hundreds of us and we had to keep on squeezing forward to make room at the back. Finally we were off, up the A625, right along Redcar Brook in a conga line (a familiar feature throughout the race), right on the lane at the top and left up the track. Halfway up, runners seemed to split, some veering off-piste to the left and others continuing up the track to the right. My assumed route followed the track so that’s what I did. MISTAKE! At the top we turned left to eventually join the others who had taken the short cut. We followed one streamline down to the one I had assumed. From now on I would just follow everyone else while keeping an eye on map and compass to compare. All I can say is that the single person trods we conga’d along did not match up with some paths on the map that we could have followed. Call it evolution. Finally, I have finally inherited an old GPS watch and this was my second race so recorded (first one was yesterday’s Woodbank parkrun). So, after 23 years, thousands of races and millions of miles (almost), I am now official. From this weekend, it didn’t never happen. I was under the impression that Glossop was the north but apparently, there’s more. Emma Peters brings us news of her annual attempt to navigate around Edinburgh at their “Big Orienteering Weekend”. 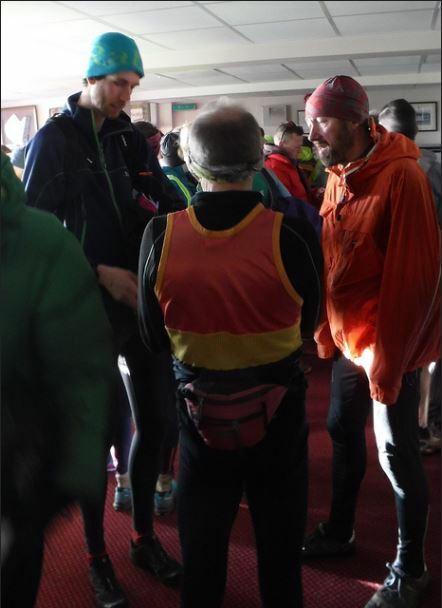 Part 1: I travelled up to Edinburgh on Saturday morning (07:43 train, an ungodly time for a Saturday!…) with the Newcastle Uni Fell Running and Orienteering Club. We always attend this event as a club and this is my 4th year in a row, it’s such a great trip! Currently writing this as I refuel with coffee and cake before the Burns night ceilidh this evening- no rest for the wicked! Part 2: So Sunday’s fell orienteering event has historically always gone very badly for me (please feel free to dig up my report from last year when I was out in a blizzard and had dropped my map…), so this year I dropped down a category to do a green race with the hopes of actually finding my way. I did a proper compass bearing at each control and took the time to work out where I was in the maze of paths in Holyrood park and by some miracle I found all the controls fairly easily! So not a quick time, but satisfying navigation. And actually when I finished I was ranked 1st senior female. Unfortunately I have no doubt that there were many more yet to take on the course, but for now let’s have it in writing that I spent time at the top. I headed to Pontefract Racecourse this Saturday to see how I stacked up against the best cross country runners in the North (AKA: “going to get your backside kicked by a load of fast lads”) A surprisingly mild and dry day meant the all the talk pre-race was how great conditions were and how fast the course was running…I was praying for rain and mud. 800ish men lined up and the start was the usual warp-speed assault on the first corner. 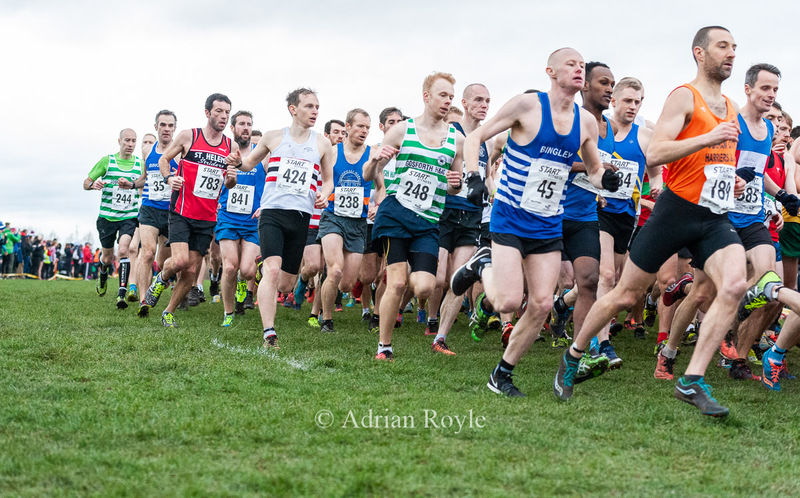 As I’ve found out before, 5:29min/mile (my first split) is NOWHERE in a field like this and I was already way down and surrounded by blokes that seemed far too comfortable considering the speed we were going on the undulating course. The race was longer than the usual local leagues at 12km, 3 long laps for the Senior Men in and around the horse race course. Anyway, despite the usual feeling of an impending heart-attack I managed not to completely fall apart. The aim was to finish top-200…I was 199th! It would be nice to get a better Glossopdale turnout for these big championships races in 2020, it’s great to be a part of and to see how you compare with the best runners. In my case, I’d say there’a room for improvement! 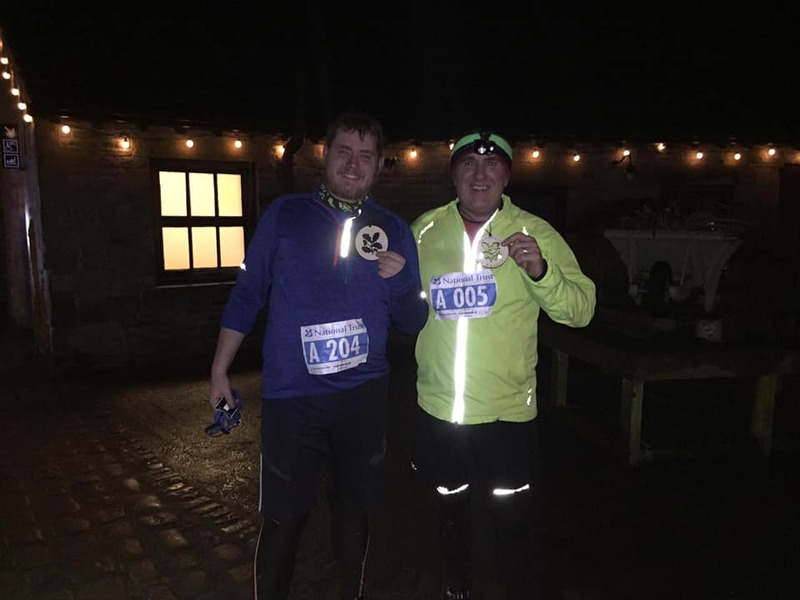 John Ryan (mostly of Carnethy Hill Runners, sometimes of Glossopdale) and I entered the Dark Mountains elite course in 2017 and found that it required better legs and more navigational skill than we possessed. This year, we changed to the A course, and took preparation seriously. I bought some ski goggles and reviewed the GPS trace of 2017’s horror show. John prepared by removing the jack and wheel nut key from his car. Once John had spent a couple of hours finding the means to fix his puncture, we set off an hour late, at 9pm, assured by the race organiser that we wouldn’t be disadvantaged, although the 11am course closure time would still apply. But obviously nearly 14 hours would be enough, so we didn’t need to worry. After our chastening experience in the elite course two years ago, we took a conservative approach: stay warm; walk a lot to avoid getting lost or tired; if possible, choose routes that will be forgiving of mistakes. This was going pretty well for a while – we made a few medium blunders, but we were never totally lost. Things started to get more difficult when the heavy rain was replaced by heavy snow then 50mph winds and -4C temperatures. With low visibility and snow-covered ground, a couple of the checkpoints were impossible for us to find quickly. By the time we reached the halfway point, we were very tired and slow, facing a second half all into the wind. We started worrying about the 11am cut-off, but although tired, we were staying warm enough, so we kept going. We clearly weren’t going to win, but we would be pleased to complete the course. As we started ‘towards’ the fourth from last, we had plenty of time to finish. For the next 50 minutes, John helpfully carried my bag and I gave absolutely everything I had. Beating the cut-off remained just within reach, but still unlikely. My main worry was that if we got timed out, I’d feel like I should try it again next year. Even as we entered the race HQ we weren’t sure we were in time. We staggered over the line and dibbed the final control at 10:59, with less than one-minute left. We took 13 hours and 49 minutes to come last out of six finishers in the A class. It looked like an epic battle at Parkrun on Saturday with Harriers making up six of the top ten. Sean Phillips came in first with Steve Knowles a few seconds later who bagged a PB in the process, followed by Steve Page, Craig Leith, Phil Swan and Matt Crompton. Immy Trinder came in as first lady, with Josie Swan second with a fantastic new PB. She also looks to be getting close to joining the 100 club – great work! Chris Webb’s XC sessions are going strong every Wednesday – this week is long loops with large lungs needed – be there (or at the AGM). Tuesday training session and Thursday social all going on as normal. Phew…. so there you go. January almost boxed off. Remember, if you want to make sure you get a mention send your scribblings and photos to gdhweeklyreports@gmail.com We have a team on standby eagerly anticipating weekly news. This entry was posted in Uncategorized on January 27, 2019 by danielstinton.